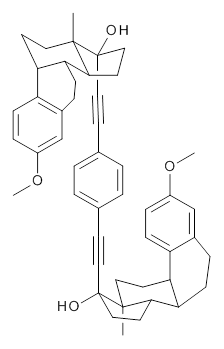 The x-ray structure of this compound, shown in Figure 1, displays two close interactions of a hydrogen on the central phenyl ring with the face of one of the steroidal phenyl rings. 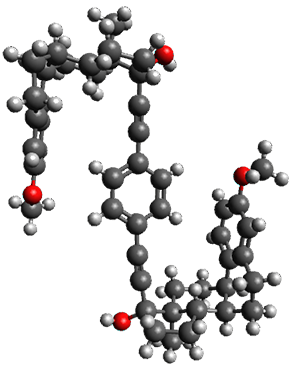 Rotation of the central phenyl ring is expected to then “turn off” one or both of these C-H…π interactions. The authors argue this as a competition between the molecule sampling an enthalpic region, where the molecule has one or two favorable C-H…π interactions, and the large entropic region where these C-H…π interactions do not occur, but this space is expected to have a large quantity of energetically similar conformations. Figure 1. 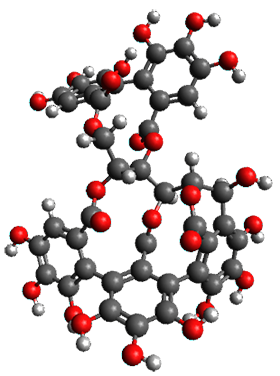 X-ray and M06-2x/6-31G(d) optimized structures of 1. Variable temperature NMR finds the central phenyl hydrogen with a chemical shift of 6.55ppm at 295 K but at 6.32 ppm at 222 K. This suggest as freezing of the conformations at low temperature favoring those conformations possessing the internal C-H…π interactions. M06-2X/6-31G(d) optimization finds two low-energy conformations with a single C-H…π interaction. These are shown in Figure 1. 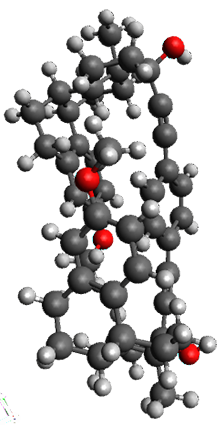 No competing conformation was found to have two such interactions. Computations of the chemical shifts of these conformations show the upfield shift of the central phenyl hydrogens. Fitting these chemical shifts to the temperature data gives ΔH = -1.74 kcal mol-1, ΔS = -5.12 esu and ΔG = -0.21 kcal mol-1 for the enthalpic region to entropic region transition. (1) Pérez-Estrada, S.; Rodrı́guez-Molina, B.; Xiao, L.; Santillan, R.; Jiménez-Osés, G.; Houk, K. N.; Garcia-Garibay, M. A. "Thermodynamic Evaluation of Aromatic CH/π Interactions and Rotational Entropy in a Molecular Rotor," J. Am. Chem. Soc. 2015, 137, 2175-2178, DOI: 10.1021/ja512053t. 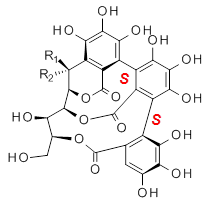 Vescalagin 1 and castalagin 2 are found in plants and also in wine and whisky. They possess some intriguing stereochemistry and the topic of interest in the paper by Tanaka and coworkers is the stereochemistry of the triphenyl fragment.1 The original proposed structure indicated a (S,S) (1a and 2a) configuration, yet a molecular mechanics study suggest the (S,R) (1b and 2b) configuration would be lower in energy. 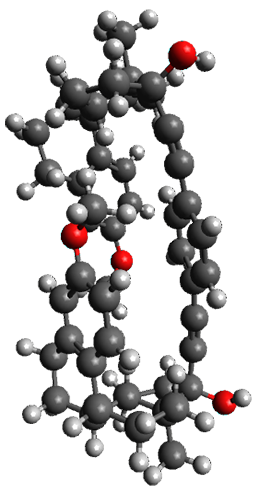 Recognizing the power of DFT computations in resolving this type of structural problem, Tanaka measured the ECD spectrum of the hydrolyzed forms of 1 and 2, namely 3 and 4. The (S,S) and (S,R) isomers of 3 and 4 were subjected to a Monte Carlo search using MM. Low-lying conformers were reoptimized at B3LYP/6-31G(d,p) including PCM, modeling methanol as the solvent. The ECD spectrum was then predicted using all conformations with a population over 1%. The computed spectrum for the (S,R) isomer reproduced the negative Cotton effect at 218 nm observed in the experiment. The structures of 1 and 2 of both stereoisomers were next optimized at B3LYP/6-31G(d,p) including PCM. The lowest energy conformation of each is shown in Figure 1. 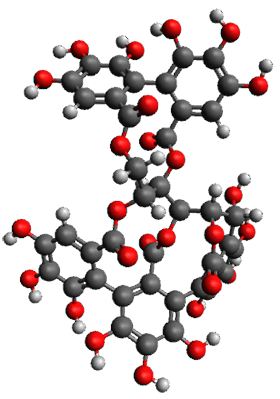 The 1H and 13C chemical shifts were computed at this level, again using all conformations with a population greater than 1%. The correlation coefficient for the fit between the experimental values of the chemical shifts and 1a and 2a are significantly lower for both proton and carbon, while the correlation coefficients compared to 1b and 2b are larger, 0.93 or better. Therefore, the structures of vescalagin is 1b and castalagin is 2b. Figure 1. B3LYP/6-31G(d,p) optimized geometries of the lowest energy conformers of 1b and 2b. 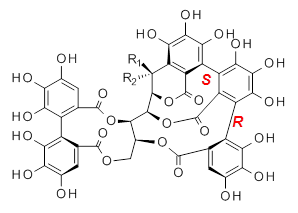 (1) Matsuo, Y.; Wakamatsu, H.; Omar, M.; Tanaka, T. "Reinvestigation of the Stereochemistry of the C-Glycosidic Ellagitannins, Vescalagin and Castalagin," Org. Lett. 2014, 17, 46-49, DOI: 10.1021/ol503212v.